All transactions are safe and secure with a reliable history in online purchasing behind each of our associates. 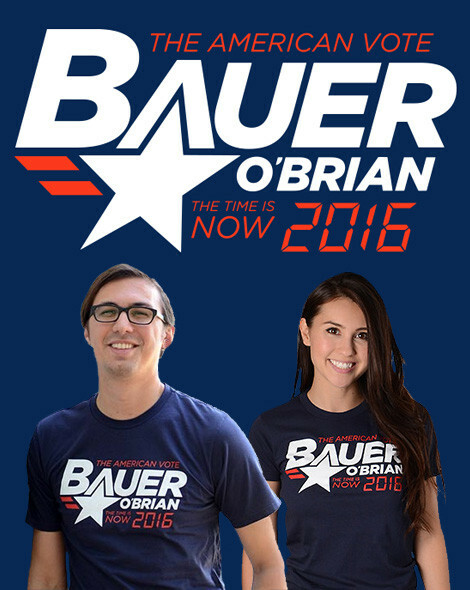 Buy the Bauer O'Brian 2016 t-shirt to own 24 clothing and merchandise. This navy Jack Bauer Chloe O'Brian tee lets everyone know who you will be voting for in 2016. This 24 t-shirt looks official, which makes it a lot of fun to wear. Pair this campaign style design with one of the CTU t-shirts below for the perfect counter-terrorism combination. Bauer has a solid track record of leading his Counter Terrorist Unit with unwavering resolve. It's about time we had a President with the same conviction. In addition to the Bauer O'Brian 2016 tee above, browse the 24 Clothing Gallery for more apparel like men's and women's clothes, kids shirts or hoodies.